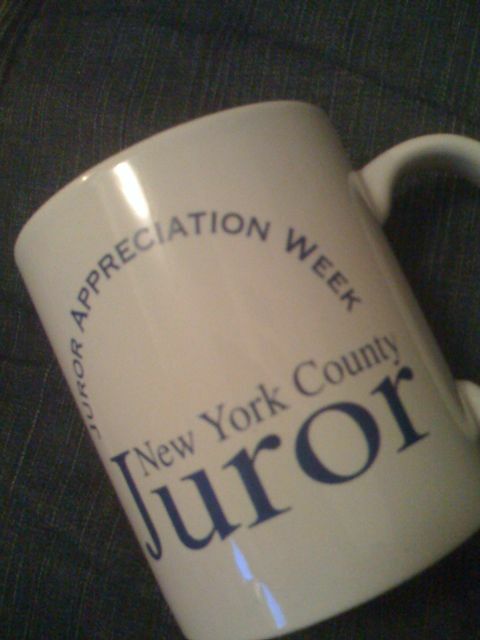 This is what they give you when you perform your civic duty. You are told not to put it in the dishwasher unless you want a plain white mug. Perhaps what I’ve gotten from jury duty is that you can lie, thieve and deceive people, but Johnny Law usually has his way. Because everybody gets sloppy. I think I want to re-read Twelve Angry Men. I was in an all-female produuction of it in high school. And if my memory holds, this is really the same damned thing. Humanity crammed in a room to determine the fate of another human being. It is a beautiful if flawed system when the people weighing in on your fate are tired, hungry, either overworked to get to jury duty or starving because they can’t work because they are in said jury duty. Reading the paper, checking blackberries, taking a nap. I listen to it all. I do. Because I hope someone would listen for me.